A while back I created a HDD TCO worksheet showing the relative costs of certain drives in no real context. 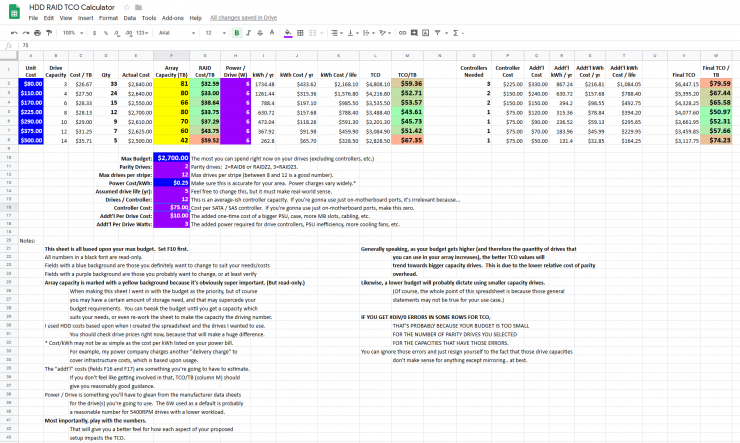 This spreadsheet aims to calculate the total cost of ownership for a RAID array, which is a much more involved affair. If you have a Google account and are logged in, you can just hit File -> Make a Copy.. to save it to your own Google Drive. If you hate Google sniffing into your private affairs, you can hit File -> Download As and grab a copy in the format of your choice. This sheet is all based upon your max budget. Set F10 first. All numbers in a black font are read-only. Fields with a blue background are those you definitely want to change to suit your needs/costs. Fields with a purple background are those you probably want to change, or at least verify. suits your needs, or even re-work the sheet to make the capacity the driving number. I used HDD costs based upon when I created the spreadsheet and the drives I wanted to use. You should check drive prices right now, because that will make a huge difference. * Cost/kWh may not be as simple as the cost per kWh listed on your power bill. cover infrastructure costs, which is based upon usage. The “addt’l” costs (fields F16 and F17) are something you’re going to have to estimate. give you reasonably good guidance. a reasonable number for 5400RPM drives with a lower workload. Most importantly, play with the numbers. This sheet is simply for guidance, but you may be surprised at the TCO numbers. case. But these numbers may server to put your priorities in perspective. Tagged computer, financial, hard drives, HDD.